Your connections can be nearly as important as your skills set when it comes to a competitive job search. Most successful job seekers report their network helped them find a position. 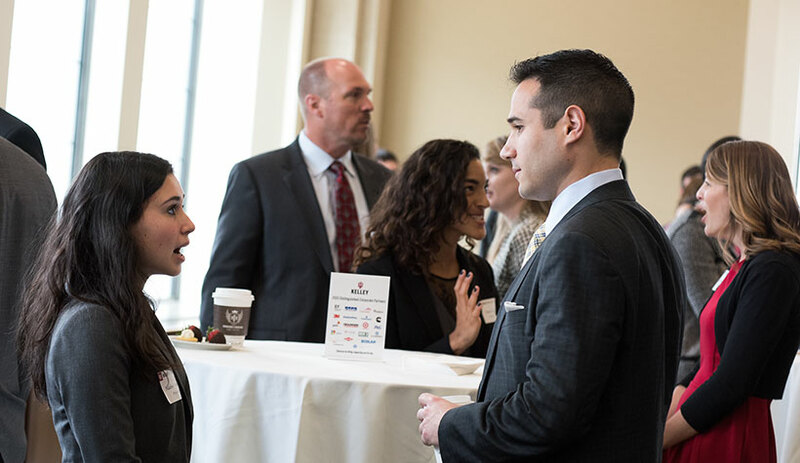 As a student, you have access to the Kelley School of Business alumni base—the largest business alumni network in the world—with members working in nearly every industry and located around the globe. Kelley Indianapolis Career Services will make it easy for you to build your network. Join the official Kelley School of Business Alumni group to stay connected. On your own page, create an informative profile headline with a professional, high-quality photo. Show off your education and develop a professional summary statement that resembles the first few paragraphs of your cover letter. Kelley Indianapolis Career Services hosts a variety of events throughout the year to connect students with employers and recruiters. Attend one of our networking events, mock interview sessions or other opportunities to meet peers and make connections with employers. Attend a Kelley career fair. Improve your chances for landing a job or internship by connecting with employers and recruiters face-to-face at a Kelley career fair. Find the next one by visiting our events page. Tips from employers at the Kelley Career Fair. Now that you know what you want in a job or internship, search and apply for the position that best fits your skills and interests. In addition to the leads you gain from networking, you can find a variety of positions at home and abroad posted on the following job boards. ShareAmerica — This agency conducts international educational and cultural exchanges, broadcasting and information programs.